Данный раздел посвящен компонентам в системе пользовательских интерфейсов (UI), которые отвечают за взаимодействия, такие как события мыши или касаний, а также взаимодействия с использованием клавиатуры или контроллера. See the Toggle page for details on using the Toggle component. 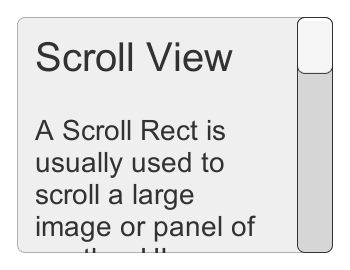 Scrollbars are often used together with a Scroll Rect and a Mask to create a scroll view. The Scrollbar has a Size value between 0 and 1 that determines how big the handle is as a fraction of the entire scrollbar length. This is often controlled from another component to indicate how big a proportion of the content in a scroll view is visible. The Scroll Rect component can automatically do this. 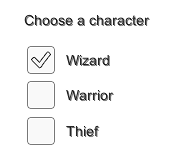 A Dropdown has a list of options to choose from. A text string and optionally an image can be specified for each option, and can be set either in the Inspector or dynamically from code. It has a OnValueChanged UnityEvent to define what it will do when the currently chosen option is changed.